(M) Mens Vintage 70s Short Sleeved Disco Shirt! Mesh Fabric w/ White & Blue Stripes! 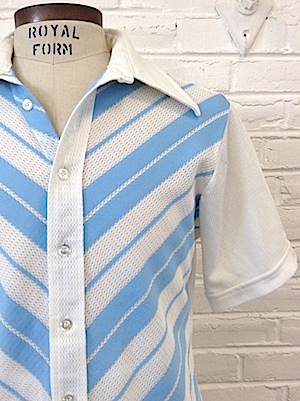 Home > Men's Vintage Shirts > Disco Shirts > (M) Mens Vintage 70s Short Sleeved Disco Shirt! Mesh Fabric w/ White & Blue Stripes! Mens vintage 1970s disco short sleeved shirt. 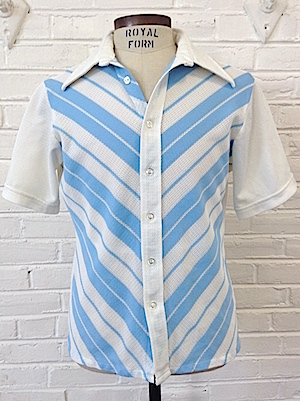 This funky shirt comes in a mesh material (think basketball shorts) in white with diagonal baby blue stripes on the front of the shirt! Has a super wide & pointy disco era collar. Closes in the front with pearly white buttons. Shirt has a straight hem and cuffed sleeves. Tagged by Challenger. Polyester/Cotton blend. Chest: 40" MEDIUM. Tagged a Large, but we are measuring it closer to a Medium.